Ringtail offers an extensive library of instructional videos designed to help you and your legal team master the Ringtail e-discovery platform. 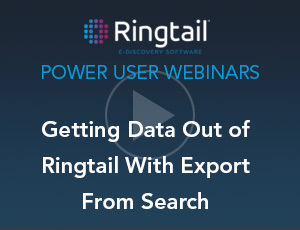 From getting started to step-by-step instruction on effective use of advanced features, Ringtail training tutorials enable your Ringtail user community to ramp-up and keep skills finely tuned. Access Ringtail University, click HERE to create an account and begin leveraging the training tutorials. Ringtail accelerates document review while also reducing costly re-work. In this lesson you will learn how to code documents individually as well as leverage Quick Codes and Coding Hints from previously coded documents. The Ringtail Learning Portal provides a guided learning experience to help you identify the training videos that best meet your learning goals. Easily chart a learning path and follow your progress to Ringtail mastery.